With the aid of modern tools and sophisticated technologies, we have been able to provide the customers with Base Plate. Under this range, we offer Truss Base Plate. These base plates are manufactured using superior-grade raw material like aluminum and other components that are sourced from the reliable vendors of the industry. In addition to this, our offered base plates are known for robust design, low maintenance and corrosion resistant finish. 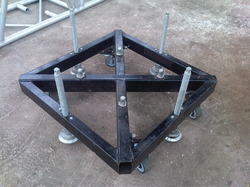 We are into manufacturing and supplying a comprehensive assortment of Truss Base Plate. Manufactured in adherence with the established standards of the industry, these plates are developed using quality-approved raw material that is obtained from the reliable vendors of the industry. Available in different specifications as per the requirements of the clients, these base plates are widely acknowledged in the market. From the day of commencement, we are engaged in catering to the variegated requirements of the customers by bringing forth Truss Base Plate. Our professionals keep an eagle-eye on the production process of these plates to ensure these plates are defect-free. Manufactured using premium-grade components, our offered base plates are developed as per the illustrated guidelines of the industry.